Samsung Galaxy Tab4 3G 7.0 is a combination of unmatched design, smart features and enriched multimedia. Samsung Galaxy Tab4 3G 7.0 features a huge 7 inch Touch Screen. It has a display resolution of 800x1280 pixels. Bigger screen gives you access to bigger and clearer images. Now reading text, watching movies, playing games and reading your favorite book on this mobile is a fun experience. 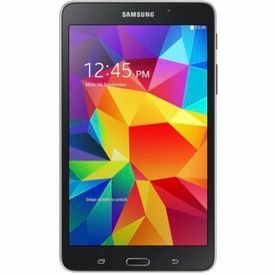 Samsung Galaxy Tab4 3G 7.0 has been based on Android 4.4 KitKat OS and is powered the powerful 1.2GHz Quad Core processor. It is also seconded by 1GB RAM. You get to experience smooth and speedy performance on this tab. Samsung Galaxy Tab4 3G 7.0 is a 3G tablet that has been enabled with Wi-Fi so that you can connect to your virtual anytime and anywhere. Email your friends and office people wherever you go and make changes in your status on the Social Network Sites. Share files and data with your friends through Bluetooth & USB as it is easier and can be done in a few seconds. Every moment comes with a memory and so the new Samsung Galaxy Tab4 3G 7.0's 3MP rear camera lets you capture these moments. Go anywhere and capture your moment and make it more memorable. You can also make video calls with this tab as it has a 1.3MP front camera.